And the winner is… Durban-based Nelisiwe Dlamini. There are no surprises there as KZN viewers are known to take a serious interest in these sorts of shows. So, as was expected Nelisiwe’s fans did their usual voted by the numbers. 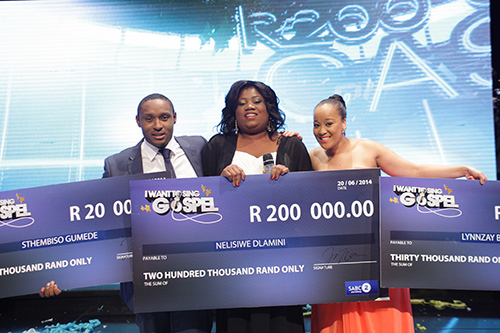 The finale which took place at the SABC’s M1 studios in Auckland Park went with a bang. We caught a sight of TV personality Howza who we believe was there to support his wife, Salamina, who happens to be this season’s presenter of the show. Also sported at the event; Mandla Gaduka who plays small-time businessman, Choppa, on SABC 1 Generations. I Want to Sing Gospel judge Tshepo Nzimande was his usual chirpy self. This despite the widely publicised rumours that he’s short changed his artist, Durban-based Gospel songbird Fikile Mlomo.